The Napa Town & Country Fair is held annually at Napa Expo, a large venue a few blocks from downtown. Its close-in location and expansive grounds attract approximately 60,000 attendees during early August. Locals and tourists flock to the varied indoor and outdoor displays/booths during a four-day period. 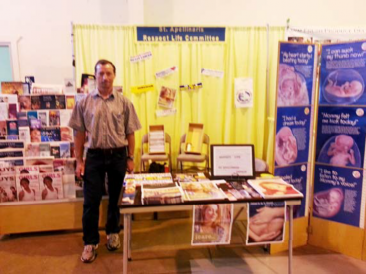 Here is where Napa Valley Culture of Life helps Mathew Amodeo create a large, inviting pro-life booth designed to attract people of all ages to discuss and explore the truth regarding life issues during the 5-day event. The booth is staffed by Matt Amodeo who welcomes pro-life volunteers who join him in answering questions, discussing issues, and presenting free literature to fairgoers of all ages from noon to 10:00pm daily. Free handouts of pro-life candies and balloons with informative messages seem to connect with the younger set. A large number of youth are attracted, some with diverse philosophies; healthy discussions are the norm.